In the wintertime, my family loves to have soup. My mom will make pretty much any type of soup, from creamy roasted butternut squash soup to spicy African Peanut Chicken soup (similar to this one!). But a few years ago she started to make escarole soup with turkey meatballs. Now, as much as I love soup, I dislike the bitter taste of raw escarole and don’t eat meat very often, so this soup did not sound appealing to me at all. Of course, my mother being a mother, she made me eat it anyway, and much to my surprise I actually liked it! 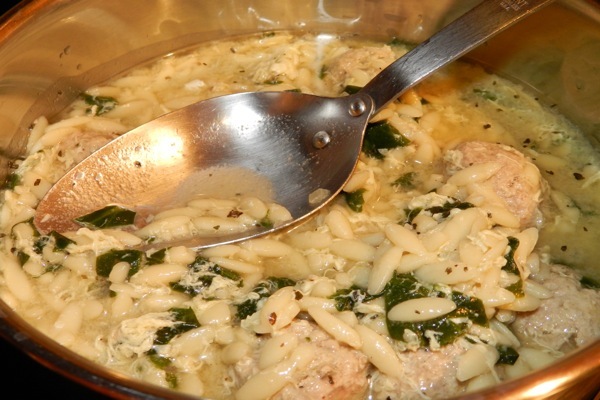 Cooking the escarole eliminates its bitterness, and the turkey meatballs add a nice texture to the soup. 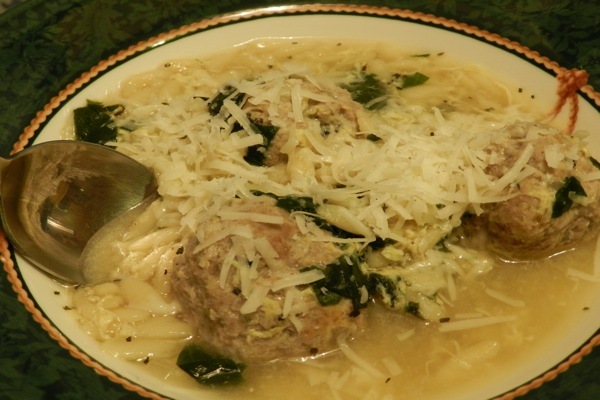 My mom’s Escarole Soup with Turkey Meatballs has become one of my favorites – hearty and easy to make, it’s the perfect comfort food for a cold winter day. Sarah McAnaw is a junior at American University where she studies International Studies and Biology. After cooking (and eating!) her way through a semester in Florence, Italy last fall, she’s headed south to Haifa, Israel this spring to study the Arab-Israeli conflict and experience the culinary flavors of the Middle East first hand. Note: While my mom uses chicken stock, beef or vegetable stock would work just as well. Same goes for the meatballs – feel free to substitute ground beef, veal or chicken for the turkey if you want. Pour enough olive oil into a large soup pot to coat the bottom (roughly 2-3 tablespoons) and warm up the oil over medium-high heat. Once the oil is hot, add the chopped escarole and cook until wilted. Pour in the chicken stock and 2 cups of water and bring to a slow boil. While waiting for the stock to get hot, make the meatballs. Season the ground turkey with whatever you would like – my mom and I have used dried herbs such as basil and oregano, or just salt and pepper – and mix with the egg, chopped onion and breadcrumbs. Roll the meat mixture into 1-inch balls. Once the chicken stock has started to boil, add the meatballs to the soup and cover the pot. Allow the meatballs to cook through, about half an hour. When the meatballs are done, stir in the orzo and cook for an additional 10 minutes to let the orzo cook. Season the soup with salt, pepper and rosemary. Ladle the soup into a bowls, top with grated cheese, and enjoy!